Home » Solartwin Features » Solar SAFETY » Solar video: Legionella safety and solar water heating storage – clean energy ideas. Solar panels. Solar water heating systems = Solar panels + solar energy. Solar thermal: solar power & solar hot water. Solar water heating and Legionella and how solar hot water storage can be made safer. Please note that the underlining in the section called dedicated solar volume has been added by Solar Twin Ltd and are not part of the original document. They are have been added to draw attention to the serious flaw in desgn in conventional twin coil solar water heating systems. Report on the Legionella compliance of the Solar twin pumped hot water system. Legionella Control International Limited, referred to from hence forth as LCI, have been commissioned by Solar Twin Limited to establish the level of compliance of their direct solar heating system with the HSE guidance note “Legionnaires Disease, The control of legionella bacteria in water systems, Approved Code of Practice and Guidance” referred to from hence forth as L8. This report will consider the product compliance with the key elements of L8 and make reference to a number of “solar Industry” guides and application papers. It is recognised that in general L8 does not apply to domestic owner occupied dwellings, however, solar heating systems are increasingly being installed in semi commercial enterprises and also in dwellings, under such circumstances L8 does apply for the protection of such tenants and landlords have a legal obligation under the Health &Safety at Work Act 1974 and also to the Control of Substances Hazardous to Health Regulations 2002 to protect the health and well being of their tenants. It must also be considered that owner occupied homes of today could be the tenanted homes of tomorrow and as such all properties should be considered as relevant. It must be noted that LCI are not design or thermal efficiency engineers and as such our comments will be restricted to those pertinent to legionella growth and compliance issues. LCI is a consultancy practice dedicated to all matters and legislation relating to the safe, and L8 compliant, operation of water systems. LCI is staffed by a team of professional water treatment chemists with an aggregate experience of over 150 years who have “grown up” with the introduction of legislation, firstly in 1988 with HSG70 and latterly with the introduction, in 2001, of the current legislative document L8. We also have two additional associate consultants, one of whom was a co-author of L8 and the second who is a former Senior Inspector with the Health and Safety Executive specialising in legionella investigative projects. The writer of this report, Richard Berry, has thirty years of experience in the industry and is a Senior Consultant with LCI. There would appear to be two main methods of delivering the energy of the sun to generate hot water for either bathing or heating purposes. Firstly there is the Solar Twin system which is referred to as “direct” heating and as such the water that is directly heated in the solar panel is passed into the hot water distribution system for end use. 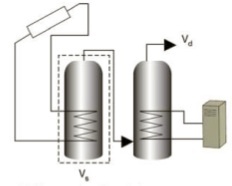 Secondly there is the “non-direct” system which takes water from the solar panels and passes this through a heat exchanger coil located inside of the hot water storage cylinder, often referred to as the twin coil system. There are various pieces of literature which seem to favour the twin coil systems suggesting problems such as freezing of the water in the collector panel and also the potential for lime scale to form in the collector panel in hard water areas. Both of these issues have been considered and engineered out of the Solar Twin system. expansion properties, has been selected to transport the water from the panel to the hot water cylinder so there will not be any leakage issues which could cause stagnation in any part of the collector system. It is well documented that lime scale deposits (predominantly calcium carbonate) can shelter legionella bacteria and that proliferation may be exacerbated. Solar Twin have considered this and recommend the installation of a water softener when calcium carbonate levels are greater than 200ppm CaCO3 and that a polyphosphate should be added to the water in conditions where the water hardness is between 100 – 200ppm CaCO3. Both of these recommendations will control calcium deposition under such conditions. At levels of calcium carbonate less than100ppm deposition is unlikely to give cause for concern. This element of the design of the solar heating systems comes up in many of the guidance documents, being referenced in Domestic Heating Compliance Guide, issued by the Office of the Deputy Prime Minister May 2006, SAP 2005 rev2 The Government’s Standard Assessment procedure for Energy Rating of Dwellings and the Energy Saving Trust Consultation Draft document Solar Thermal Heating System Specifications and also cross referenced in MIS 3001: 1.2 February 2008 to the Domestic Heating Compliance Guide. These documents seem to have been solely dedicated to energy issues relating to solar heating systems but in doing so have paid insufficient attention to the requirements of legionella risk management and in particular the recommendations in the HSE guidance note L8. As stated in the introduction of this report LCI are not energy consultants and thus cannot comment on whether this is for energy saving purposes, but from a legionella proliferation point of view to have such a large volume of water sitting below the secondary heating coil has to be seen as a serious flaw in design, as on days where the solar gain is limited, this volume of water is unlikely to achieve the L8 recommended temperature of 60 °C and thus may pose a threat of legionella proliferation. This problem will be exacerbated with the use of a pre-heat cylinder as the overall stored volume will be nearer to two days and thus falls significantly outside of the L8 recommendations for stored water. The recommendations for the size of this “dedicated solar volume” range from 25 litres per m2 of collector panel area to 50 litres per m2 of collector panel area and thus is most likely to give a hot water storage cylinder of greater than 24 hours capacity which contradicts the recommendations of L8 which clearly recommend that water storage is less than 24 hours. There is a suggestion that the twin coil system is of a “safer” design. We cannot accept this suggestion for the reasons stated above and in addition we believe that there may be circumstances, ie high demand, when 60 °C could not be achieved. 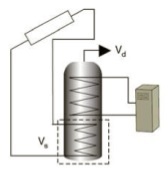 This in our opinion justifies the design and decision of Solar Twin to avoid twin coil systems having a dedicated solar volume unless it can be guaranteed that the entire cylinder contents will heat to 60 °C for at least one hour per day. Solar Twin define this as a dedicated solar volume in time. The Solar Twin system, however, has a secondary heating coil located at the base of the storage cylinder which is actuated, in the evening, for one hour per day and thus ensures the entire hot water storage cylinder is heated to 60 °C for the one hour period. With this design the Solartwin system, in theory, has no “dedicated solar volume” and thus fails to comply with the documents cited above. From a legionella perspective this decision of non-compliance has no credibility and we see no reason for the direct system to be deemed to be non-compliant. There is one area of the Solar Twin system which may theoretically be subject to stagnation, this is the small volume of water in the pipe work and within the silicone rubber tubing within the collector panel (total approximately three litres) which during extended periods of low solar intensity may not see any movement. However, in the unlikely event that this volume of water does remain static it is highly probable that the water will be of such a low temperature, ie less than 20 °C, that no legionella proliferation would occur. The fact that water is drawn from the base of the hot water storage cylinder, ie the point at which fresh cold water also enters the cylinder, suggests that extended periods of no flow are highly unlikely and thus deemed to be of very low or negligible risk. It may be worth considering the use of a data logger to demonstrate this highly improbable effect. There is, in some cases, the issue of blending valves, often referred to as thermostatic mixing valves, (TMVs). TMVs are a common means of preventing scalding by blending very hot water with cold water. Where taps or other outlets are very close downstream, the usual temperature rangefor the blended water is 39 – 43 °C. As these are the typical delivery temperatures, it is appropriate that L8 guidance states that ideally a single TMV should not be used for multiple outlets, that a single valve on the outlet from a cylinder is not ideal and should be avoided if possible and that the pipe work containing blended water should be kept as short as possible. 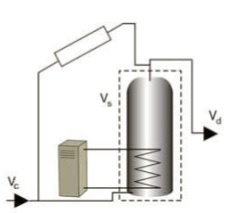 However, with solar, the cylinder contents could be unusually hot and thus a TMV would be installed at the cylinder outlet to reduce the temperatures to just over 60 °C. 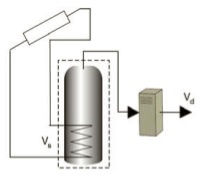 While it is accepted that delivering water at greater than 60 °C will reduce (but not eliminate) the risk from scalding while also complying with the L8 Code of Practice, there is a potentially significant upstream Legionella risk to consider and minimise: this relates to the cold water supply pipe which at times of low solar intensity might see little flow and thus would create a stagnant dead leg. In such circumstances if TMVs are installed in order to prevent the hazard of scalding they could generate an even greater problem of legionella proliferation. When TMVs are installed they should be fitted so as to minimise the length of the cold water supply pipe as far as is practical, ideally no more than 1.5 pipe diameters away from the cold feed tee-off point. Many synthetic materials, due to high carbon content, are able to support growth of a range of biological agents, including legionella. Solar Twin Limited have subjected all materials used in the construction of their equipment to an independent laboratory who have certified that all components satisfy the criteria set out in BS6920: Part 1:2000 “Specification” and thus comply with the requirements of the Water Regulations Advisory Scheme Test of Effect on Water Quality (BS6920:2000): Odour & Flavour of Water/Growth of Aquatic Microorganisms/High Temperature Tests. The selection of non-biodegradable components, especially the silicon rubber, is clearly of value in minimising the potential for bacterial growth within solar hot water systems and is a key element of the ACoP. A conventional domestic dwelling hot water system is, in modern times, linked to the domestic central heating system which typically would, for the normal family setting, operate no more than twice per day, often early morning and late afternoon/early evening. In such circumstances there will be variability in the temperature of the stored hot water. The use of solar heated water is considered to be no different to that which has been the UK practice for many years and thus is deemed to pose no greater risk of legionellosis to those more traditional methods of hot water generation provided that storage of hot water is held at a temperature of at least 60 °C for a period of a minimum of one hour once per day. Our Edinburgh invention, the Solar Twin design, and overall application concept, has taken great account of the dangers posed by the proliferation of legionella bacteria in hot water systems and thus offers significant safety improvements compared to the designs of the more traditional twin tank and/or twin coil systems. When operated as per the manufacturers instructions we believe that the Solar Twin system takes full account of the design and operating principles of the L8 Approved Code of Practice and Guidance. An external link to an interesting Legionella (aka L-word) site is here. If you have a twin coil solar cylinder and want to consider making it safer here is some advice.